Laminate and melamine surfaces are known for becoming outdated quickly. They also tend to get scratched and nicked with normal use, and many countertops have a burn mark or two. And unlike homogeneous solid surface materials, such as Corian or butcher-block wood, both of which can be effectively sanded down smooth and brought back to like-new condition, laminate and melamine are composed of multiple layers that should not be sanded through. But you can do the next-bast thing: resurface laminate or melamine with a quality paint job. Unlike wood, laminate and melamine cannot be sanded down to a natural grain; they have no natural grain. With wood, exposing grain is vital for the paint to adhere. Laminate and melamine are designed to repel kitchen spills, like food, oil, and water. Unfortunately, paint is similar to a spill, too, and these surfaces do a reasonably good job of preventing paint from sticking. Therefore, it is vital to prepare the surface so that the paint will stick over the long term. Improperly applied paint will peel off of laminate and melamine, creating a bigger mess than you started out with. The keys are to degloss and roughen the plastic surface of laminate and melamine and to use the right paint or coating products. Some paints call for primers; others can be used without it. 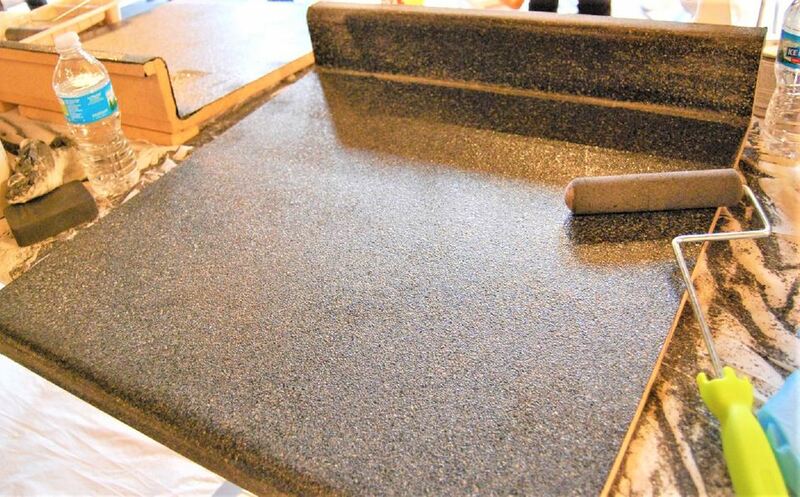 For counters, instead of using ordinary paint, you might want to purchase an all-in-one countertop resurfacing system, such as Rust-Oleum's Countertop Transformations. These kits are formulated for the rigors of countertops by laying down a thick top coat that is securely adhered with a bonding primer coat. These systems are markedly different from paint-only processes in that they include a layer of solid decorative chips. The chips are dispensed from a hand-cranked spreader, much like an outdoor spreader that you use to disperse grass seed. These chips lay down a thick coat that is far thicker than paint, plus it effectively covers up all scratches. Alternatively, you can use a urethane-reinforced acrylic paint, such as INSL-X Cabinet Coat. While more expensive than the ordinary acrylic-latex paints you would use on drywall, the urethane-reinforced products have better hiding abilities and will stick better to problems surfaces. Cabinet Coat is designed to adhere to plastic, metal, and urethane surfaces without a primer, but laminate and melamine surfaces should be sanded before painting. A third option is to apply a 100 percent acrylic, flash-bond primer, such as XIM (Rust-Oleum), Bullseye 1-2-3 (Zinnser), or Fresh Start (Benjamin Moore), followed by two coats of satin or semi-gloss enamel paint and two coats of clear acrylic sealer. Remove all items near to the cabinets or counters to a garage or a covered patio. Open up the windows. If desired, set up a box fan so it blows out of one window, to promote cross-ventilation through the work area. Place drop cloths on the flooring and tape contractor's paper or plastic on all surfaces that will not be receiving the coating. Confine the work area with plastic sheeting to prevent sanding dust from traveling throughout the house. Protect yourself from sanding dust with a dust mask or respirator. Sand down the laminate or melamine surface with 150- or 180-grit sandpaper. Frequently check that you are bringing down all glossy surfaces to a matte (or flat) finish by checking with a work light. Do not sand down too hard or you risk damaging the thin wear layer of the laminate or melamine. Wipe down the surface with a tack cloth, using light pressure to prevent transferring the wax from the cloth to the surface. Follow by wiping down the surface with mineral spirits and clean, lint-free cloths. Let the surface dry completely. Apply a thin coat of paint to the entire surface, using a paintbrush for the edges and tight spots and a roller with a high-density foam roller cover (for smooth surfaces) for the flat areas. Take special care to maintain a wet edge while painting: Overlap the edge of each painted section with fresh paint before the previously painted edge dries. Allow the first coat to dry for at least 6 hours or as recommended by the manufacturer. Note: You can passively ventilate the work area, if desired, during the initial drying process for any of the paint coats, but do not use fans, which can pull airborne dust and debris onto the wet paint. Ventilate with open windows only if there is no air disturbance or strong drafts in the work area. Also make sure the temperature and humidity levels in the work area stay within the manufacturer's recommended ranges. In general, odor from drying or curing coatings is strongest while the coating is still wet. Apply one or more coats of paint, using the same techniques. Let each coat dry as directed. Let the final coat cure fully for two to three weeks before placing any heavy objects on it or scrubbing the surface vigorously. You do not need to ventilate the area during this period. In the meantime, you can use the surface gently and clean it only with a damp cloth. Letting the paint cure fully before using the surface as usual will help prevent appliances and stored items from sticking to the paint or marring the finish.